Now that the 2008 Beijing Olympics have kicked off, we’re a step closer to the handover of the Olympic flame to London on Sunday 24 August, and Redbridge will be welcoming it with open arms at Inspir8tion, a free carnival event. Inspir8tion will be held at Redbridge Cycling Centre from 11am to 7pm, to celebrate the handover of the Olympic Games from Beijing to London marking the beginning the London’s term as the host city for the Olympic and Paralympic Games in 2012. 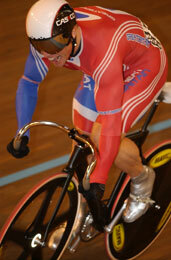 2002 World Champion track cyclist, Craig MacLean will be guest of honour. Craig will join thousands of visitors at the event for an afternoon of music, dance, performance, sport and wacky entertainment. Come and enjoy an amazing day and witness some of the most outrageous and fun acts on the planet. The main attraction will be Air Carnival which will be led by teams of masqueraders and cyclists from local schools and sports groups, dancers, youth theatres and musicians. 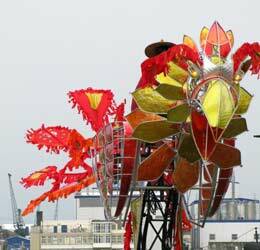 The procession’s finale will take you on an unbelievable journey where you will take in the sights of a giant fiery Phoenix bird and two enormous Kestrel puppets. A firework display featuring a death-defying human Catherine Wheel will bring the evening to a close. Balloonatics is certainly no hot air act but promises to impress. This balloon-art street act will decorate people with incredible hats, giant costumes and hilarious balloon toys which will have people laughing themselves in circles around the track. Shirt or squirt is an original pedalled-powered environmentally friendly amusement where two riders compete in an endurance cycle challenge to be the first to empty their pedal-powered tank. The winner gets the glory and the loser gets squirted with water! For those who can’t sit still for long, a puppetry walkabout will wow both children and adults with magical performances and for those with a bit more get up and go, why not let the Olympics inspire you and try sports taster sessions in rowing, cycling and basketball or see how fit you are with our body MOTs. 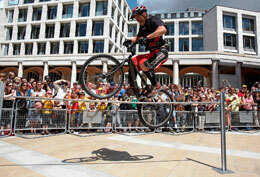 In keeping with the Olympic sporting theme, Cyclemagic will provide an element of surprise when they bring a roadshow with a difference. Craig MacLean will be happy to chat to young athletes and Olympians of the future about just what it takes to become a sporting hero and gold medallist and will also be sharing his experiences. Cllr Linda Huggett, Cabinet Member for Leisure, Culture and the Olympics, said: “To have a world champion cyclist in our presence is fantastic for the borough and for its young athletes. As part of Inspiration, Redbridge Museum will be holding a display about cycling heritage in the borough and asking people to take part in the 'People's Record'. This is a chance for you to record your thoughts and hopes about the London 2012 Olympics. For the first time in Olympic history, museums, libraries and archives across the country will capture people’s experience of living in an Olympic host nation. This will form a lasting record for future study.